If you've been tuned in this week, you already know that it's been an exciting and challenging time for the anti-Trump resistance in general, and for Indivisible: Conejo in particular. On the political scene, Gov. Jerry Brown has signed legislation that we cheered on, and pushed for, throughout the spring and summer -- from the California Values Act to the DISCLOSE Act to legislation on housing, education, healthcare and more -- cementing California's year of opposing Trumpism through state policy. Unfortunately, while Brown was working within the accepted bounds of legislative activity to help Californians live better lives, a series of unilateral Trump actions took the nation in precisely the opposite direction -- circumventing the will of Congress and the people while harming the lives of tens of millions of Americans. Trump's sabotage of the Affordable Care Act's contraceptive mandate, marketplaces and subsidies; his spiteful and ludicrous "decertification" of the Iran nuclear deal; his continued threats and intimidation against antagonists ranging from Sen. Bob Corker to the news media to North Korea to Hillary Clinton; his inattention to the plights of Puerto Ricans, northern Californians and the Dreamers ... all of these horrors demonstrated anew the moral and intellectual bankruptcy that has infested American government. They also offer all the incentive we could possibly need to double down on the resistance against Trump -- and Indivisible: Conejo stands ready and eager to act. You, our 1,800-plus activists, are rising up this fall with electoral politicking, activating voters from Virginia (phone banks and -- coming next week -- postcard parties) to Simi Valley (voter registration canvasses) to Fresno (another #Blue22Canvass is happening this weekend). You're remaining vigilant with phone calls and messages to Members of Congress and executive-branch officials. You're responding in impressive numbers to calls for protest on gun violence, healthcare, DACA and other issues. We can't tell you how much your activism inspires us, even as we offer more and more opportunities for you to push yourselves further. We're pushing ourselves as well; you'll see it in the coming weeks, as we bring our issue team leaders and activists together to plan a 365-day campaign of electioneering and advocacy aimed at restoring progressive values to Congress and state legislatures nationwide. As you probably read earlier this week, Jennifer Eis -- the third member of what we have come to call the "triumverate" at the top of Indivisible: Conejo -- has left our organization to join the burgeoning national political group Swing Left, taking the position of Deputy Field Director for the Western United States. It's an outstanding opportunity for her to bring her skills as an organizer to a wider field of endeavor ... and to get paid for it (no small matter!). We wish her all the best, and we look forward to our organizations intersecting frequently in the coming months as Swing Left helps steer the electoral work of groups like ours across the nation. 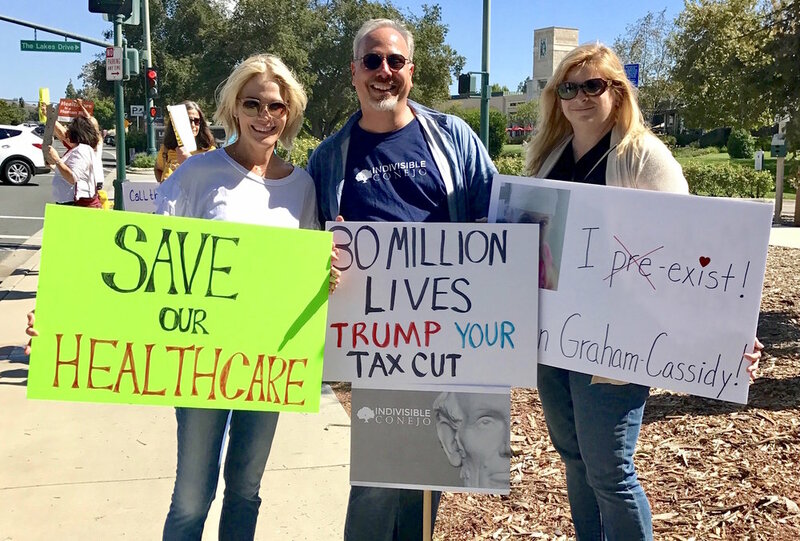 Meanwhile, Indivisible: Conejo moves forward! We know you'll want to stay engaged, and in fact extend your activism, as the 2018 midterm elections approach. The fate ... and let's face it, the very soul ... of our nation is at stake over the coming year, and we can't afford to sit on the sidelines. Let's gather our strength, and let's get ready to spend the next 365 days showing America what it means to be Indivisible! We Indivisible: Conejo activists love our Postcard Parties! This week, we'll be putting our creativity to work on behalf of Postcards4VA.com, sending notes to Virginia voters urging them to vote for progressive candidates on Nov. 7. We'll ALSO be sending cards encouraging California Assembly's Select Committee on SB 562, the Healthy California Act, to get the bill back on track for passage. We'll have signups for people to bring cards, stamps, pens & markers, snacks & drinks, etc., early this week, so keep an eye out on Facebook and our website! JOIN THE BRADY CAMPAIGN AT THE THOUSAND OAKS STREET FAIR! Sunday, Oct. 15, 9 a.m.-4 p.m. The Thousand Oaks Street Fair, sponsored by the Rotary Club, is the biggest of its kind in Ventura County. The local Brady Campaign and our Gun Violence Prevention Team will have a booth, so please stop by and say hello! Indivisible: Conejo activists will be around the fair, so look out for us! A Select Committee of the state Assembly is meeting to discuss SB 562, and the California Nurses Assn. is offering transportation from select SoCal locations to Sacramento for activists supporting the bill. Make the round trip in a day, or stay overnight! There will be rallies outside the Capitol both mornings, and activists may sit in on the meetings. RSVP here to learn more. 10/13 - Trump's ACA Sabotage Must Not Stand!